Dumbwaiters are a great alternative if you just need assistance with the groceries, laundry, trash or household supplies. Residential dumbwaiters have a lifting capacity of 100 or 200 pounds depending on the model. With a standard roll top gate, they keep your items safely in place while in transit. You can opt for a removable and adjustable shelf allowing you to maximize the height of the dumbwaiter. Safety is never a question with the standard slack cable monitoring switch, car safeties, final limit switches and a UL® certified controller. If your application requires a commercial dumbwaiter, Gulfside Elevator has many versatile models available with load capacities of 300 or 500 pounds. 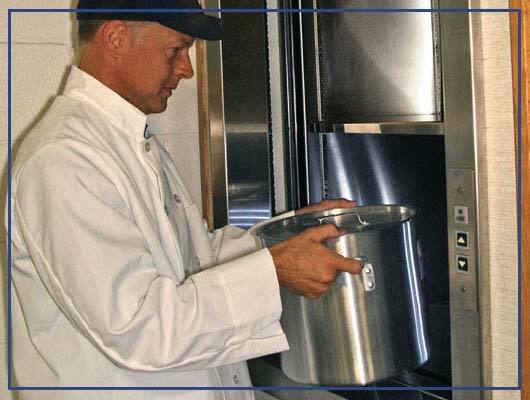 Safety, reliability and convenience are designed into every dumbwaiter giving you peace of mind for your multi-level business. Cars come standard in a powder-coated steel finish with the option for a complete stainless steel car. With bi-parting or slide-up gates, code compliance is always a standard. The dumbwaiter’s winding drum drive system and heavy-duty steel guide rails are designed for longevity and efficiency. Commercial hoistway doors are also available for the complete package of safety. Homeowners also find these models ideal when larger loads will be moved in the residence.